Obama File 28 Top US Communist-Elect Obama "Go On to Change the World"
Libero Della Piana is New York State chairman of the Communist Party USA, former national organiser of the party and a member of the CPUSA's 140 strong National Council. 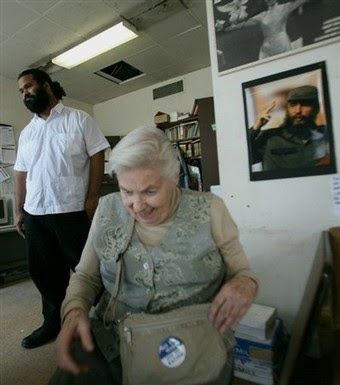 Like virtually all of the CPUSA's several thousand members and supporters, Della Piana is working to to elect Barack Obama to the US Presidency. Following the CPUSA "line" Della Piana supported Barack Obama in the Primaries against Hillary Clinton. Moments ago, Associated Press declared the state of Utah for Obama. To me this is truly amazing and exciting. It represents a huge shift in the consciousness of the country and an amazing moment for the democratic forces too. Obama appears to be sweeping many of the Prairie States (North Dakota, Kansas, etc.) as well as other parts of the Mountain West (Idaho, Colorado). To me this represents a victory in and of itself. Comrade Della Piana sees the upcoming US election as an opportunity to change the direction of the US. Della Piana This Labor Day working people and their families in New York State are in an exciting and challenging moment. For the first time in years, the labor movement together with its broad movement allies, has the potential to change the course of the country in a more positive direction. The 2008 Presidential election is historic. Not only has the Democratic Party nominated an African American as its candidate for the first time, but there have also been record turnouts in the primaries and a vibrant grassroots movement has developed. Della Piana sees the election as a choice between Republican conservatism and a new people/union driven movement for social change. Della Piana What’s at stake for working people in the election couldn’t be starker. McCain represents four more years of the failed Bush policies of war and aggression, tax-breaks for the rich and big corporations, and destruction of social services vital to working-class communities. On the other hand, the candidacy of Barack Obama reflects and represents the massive desire for change: for a livable environment and a sustainable world, for jobs with justice, for peace and progress, for fair taxes and a program to rebuild our cities and towns. Let's be clear, there is a big difference between these two choices. McCain is no "maverick." He is a real conservative who puts the "rights" of the rich and corporations ahead of the needs of the working majority. McCain received a dismal zero percent pro-labor voting record for 2007 while Obama has a stellar 100 percent record and said he looks forward to signing the Employee Free Choice Act into law as our next President. 25 percent of the Democratic Party’s Convention delegates were union members, while the GOP Convention speakers took turns bashing unions and blaming them for the economic crisis in the country. Della Piana looks beyond Obama. The election is a chance to shift the whole US government to the left. By electing more leftist Democrats, the CPUSA hopes to tilt the direction of the US government towards socialism. The CPUSA, through their influence in the US union movement wants to completely alter the US political landscape. Della Piana Of course, deeper Democratic majorities in the House and Senate and in an increase in progressives in the Congress will also shift the terrain in Washington, opening the way for legislation to turn-back the damage of the Bush years, and to repair the country from 30 years of right-wing rule. This is no time to sit out the election. We not only have a chance to undo the Bush Agenda, but to win big transformative victories and set the stage for higher levels of struggle. A decisive electoral victory in November will lead the way to passage of the Employee Free Choice Act, the end of the occupation of Iraq and implement some form a of national health care. The working-class has been on the defensive for decades, this election has the chance to put the movements back on offense, to set the agenda for the country. A big people’s victory in November is not the end of the struggle, but a new beginning on more favorable ground. The mass movements of the people: the peace movement, student movement, civil rights movement, women’s movement, and labor movement have to keep the pressure on to ensure a new Democratic Administration and Legislature keep the promise to meet the people’s needs. Change the US government and world revolution has no significant opposition. Della Piana Together, we can win in November and together we can go on the to change the world. Libero Della Piana is right. The entire direction of the planet depends on the outcome of the US election. Several thousand communists and socialists, directing several million unionists, peace activists and "community workers" could be enough to tip the balance. In what could be a knife edge election, Della Piana and his comrades, may just hold the balance of power. May God help us through the next 4 yrs!! !